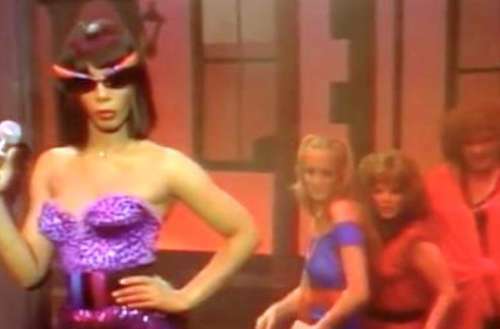 While you might think a show called The Donna Summer Special would have aired in June to capitalize on the disco diva’s last name, ABC aired it on Jan. 27, 1980. The hour-long special was a somewhat typical variety show of the era — which, if you’ve ever seen, say, Pink Lady and Jeff or The Brady Bunch Hour, you know means it’s absolutely wacky. The Donna Summer Special is actually a little bit more sane than those specials. Summer and her director Don Mischer and writers Ernest Chambers and Rod Warren made the decision to focus more on Summer’s music to the special’s benefit. Which isn’t to say there aren’t guest stars, weird setpieces and bizarre comedy sketches, because, after all, it is a variety show. But unlike Pink Lady and Jeff‘s baffling insistence on jokes delivered by its non-English-speaking hosts, The Donna Summer Special knows where its strengths lie. The special intercuts a performance at the Hollywood Bowl with filmed inserts. The special opens with Donna Summer’s disembodied head telling a story about a little girl whose dreams would someday come true. (Surprise: The little girl is Summer herself!) From there, it cuts to a piece where Summer sang in church pre-fame. But while it looks like the special might be a biography of the singer, this is the only glimpse we get into the Donna Summer story. She used to sing in church — yada yada yada — now, she’s performing a sold out show at the Hollywood Bowl. Summer’s disembodied head pops up a few times throughout the special, introducing segments. Most of the segments are just quasi-music videos — “Sunset People” is shot on Hollywood’s Sunset Boulevard, with a cheap video effect that makes Sunset look somehow seedier. “I Got It Bad and That Ain’t Good” takes place in a golden-age-of-Hollywood nightclub with dancers holding up masks of era-appropriate stars. While these setpieces are good, it’s the stranger things that are really worth watching. There’s a segment near the beginning (introduced by the floating head) where Summer sings a bedtime song to her daughter, Mimi Summer. The scene then turns into a dream in Mimi’s head where she and a bunch of other little kids are singing and miming to Donna Summer’s song “Fairy Tale High.” Mimi’s dressed just like her mother, and other kids are dressed as her band, backup singers and dancers. It’s vaguely unsettling. Summer: HOLD IT! Not that sensitive! Guillaume: You got me all wrong, baby! I’m an angel — up in Heaven we love men and women equally! Summer: Well, I got some friends here in Hollywood that feel the same way. The special ends with “Last Dance” live at the Hollywood Bowl, and Donna Summer brings up a number of people in the crowd — and the first two people she brings up are a gay couple. In fact, the onstage crowd is mostly men — and earlier in the special, during “Hot Stuff,” they cut to two men wildly dancing. It’s great to see a special where she clearly embraces her gay fans, running counter to the long-standing myth that Summer had turned her back on her gay fans.